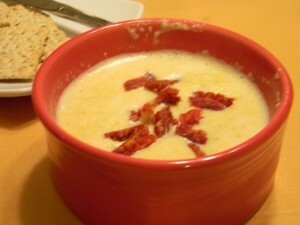 In the last few weeks, I have been falling in love with corn chowder. 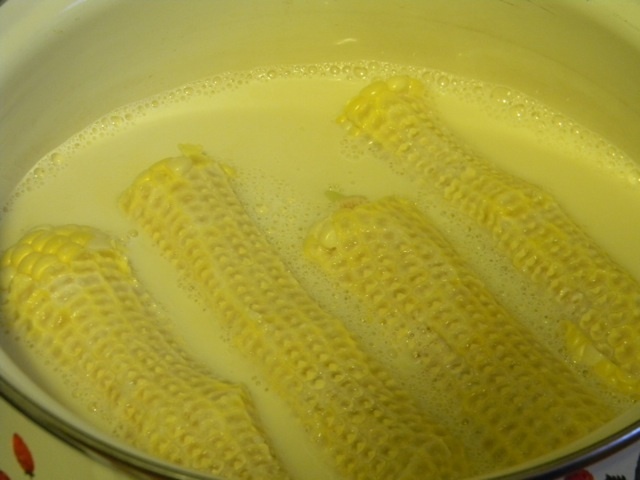 A few weeks ago, French Fridays with Dorie even featured a sweet corn soup. My problem with all of these soups: the creme or milk or some kind of dairy. I decided to take matters into my own hands and do a little substitution. I started with a recipe from Dorie in her Around My French Table cookbook, but I began to make some tweaks and adjustments. First the dairy and second, I wanted some kick to the soup. Dorie suggested used chile peppers as a garnish but I wanted the spice in every single slurp. I raided our garden and CSA share and found some nice spicy peppers. With an increase in veggies, the hot pepper and soy milk, it turned into a hearty, spicy and healthy corn chowder. I know we are near the end of the corn season, but I hope you can find some fresh ears to try in this soup. It’s a great way to bid farewell to summer. *I used one hot banana pepper, 1 Serrano pepper, 1 jalapeno and three little red firecrackers that we have yet to identify but we have a ton of them in our garden. In a saucepan, pour in your soy milk and add the corn-less cobs. Not the best picture for contrasts, but you get the idea! At medium high heat, get the milk to boil and then turn off the heat and cover. Really I just wanted to show off my cute little pot. 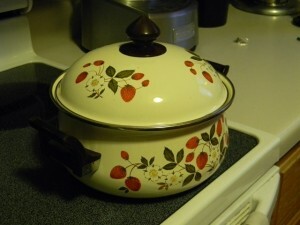 It was my grandmother's. In a soup pan or dutch oven, melt the Earth Balance at medium high heat. Add the onions and cook until the onions are clear. Add carrot, celery, garlic, and peppers. Cook until soft. 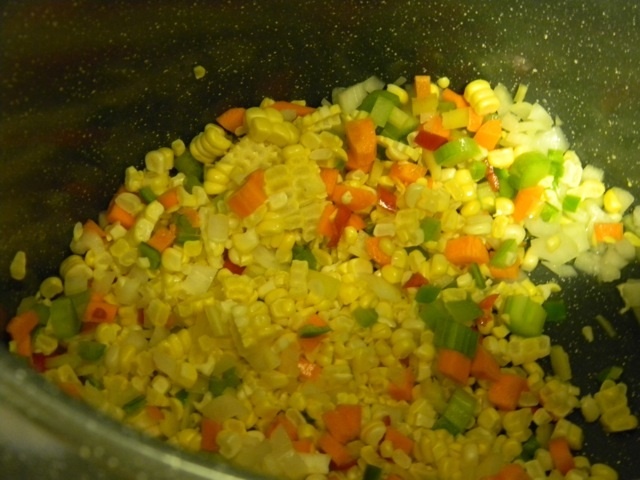 Add the soy milk, corn cobs, water and sprigs of herbs (thyme, bay leaf, and rosemary). Using an immersion blender, blend until you reach the desired consistency. Serve with a salty garnish. I used chopped sun-dried tomatoes. Enjoy! This soup will knock your socks off. Not only because it’s good, but it’s that spicy. I did discover when eating leftovers that it does mellow out in time but who’s to say you will even have leftovers? I was also really surprised by how filling this was. It really can standalone as a dinner though you may want to serve either bread or beer with it just so you have something to control the heat. 3,001 Comments on "Sweet and Spicy Vegan Corn Chowder"